What is the expected recovery from plica surgery? What is the expected recovery from plica surgery? How can you know if pain and swelling are normal after this knee surgery? I address those concerns in my latest Ask Dr. Geier column. 3 weeks ago I had surgery on my knee to what the surgeon thought was a torn medial meniscus. She gets to the point where she was going to get the scope in and she couldn’t get it in because my plica was so big that it was blocking my entire knee from view with the scope. She removed the plica of course. My entire knee was swollen and it was acting like something was torn for over 3 months. My question is since the surgeon had to mess with my kneecap a lot how long will it be before I will be able to dance? The doctor said 3 months. Is that a good estimate? Recovery from knee surgery can often take longer than most patients think. 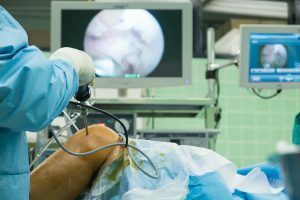 This observations seems to true whether the surgery involves trimming out a meniscus tear, resecting a plica, or other arthroscopic procedures. While the underlying problem is treated and better within a few days, it can take weeks or even months for the swelling to completely resolve and motion and strength to return to normal before the athlete actually gets back to sports. Plicae within the knee are usually treated nonoperatively. Occasionally I will resect a plica when I am doing a surgery for another problem, such as a meniscus tear. Even then, I usually leave plicae that I find incidentally unless it appears swollen and inflamed. In these cases, I am afraid that the plica could continue to serve as a problem even after the patient has recovered from the meniscus surgery or whatever procedure I went in to perform. Resection of the plica usually does not add much to the procedure. Occasionally it causes a little more swelling than one might expect from a meniscus surgery. This increased swelling could cause some increased quad weakness early on. Having said that, I think aggressive efforts to decrease swelling and regain range of motion, especially if the athlete works postoperatively with a physical therapist, should have the athlete back to sports in 6-12 weeks. Often the athlete is cleared to play sooner than that, but maximum medical improvement can take months to reach. Are Abby Wambach’s soccer headers dangerous to emulate?